Kant's categorical imperative is designed to be used when asking a question of oneself: What should I do? Or, more precisely, what is "right" or "moral" for me to do? 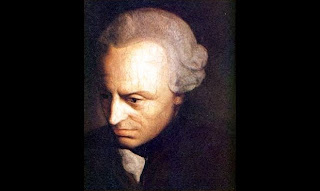 Kant's answer to that question, which is really an inquiry into morals, is this: You must "act only in accordance with that maxim through which you can at the same time will that it become a universal law." That is his purely philosophical formulation of the categorical imperative. The categorical imperative has been enshrined in religious traditions as the "Golden Rule," and it is sometimes expressed in other ways, too. For instance, Silicon Valley entrepreneurs have translated the categorical imperative into this advisory: "Eat your own dog food." Frequently, when thinking about politics, we start thinking about what "other" persons should do. What should the Democrats do? What should the Republicans do? What should the President do? What should the City Council do? These questions, clearly, are perfectly appropriate. However, maybe it would make sense for us to apply a kind of "reverse twist" to the categorical imperative, as we ask these questions. In other words, if we have opinions about what the Republicans, or the Democrats, or the President, or the City Council should do, are we already doing those things ourselves? If not, maybe we should be posing those questions to ourselves, not others. Politics is not a spectator sport, and our democratic politics is particularly about what we are going to do, not about what others ought to do!